Posted in Uncategorized on September 14, 2018 by Lava Light. On June 3, 2018, I took a doors-off dawn helicopter ride over the Puna flow. The pilot spotted something unusual and pointed it out to me. He was pointing to the spot where the largest freshwater lake in all of Hawaii had stood the day before. I say “had” because it was suddenly gone. The lava flow had snaked inside the Kapoho Crater and evaporated the lake completely. The lake was at least 400 foot deep in spots…so this was a big deal. It not only steamed off all the water…it then filled in the depression with lava. Green Lake was no more. 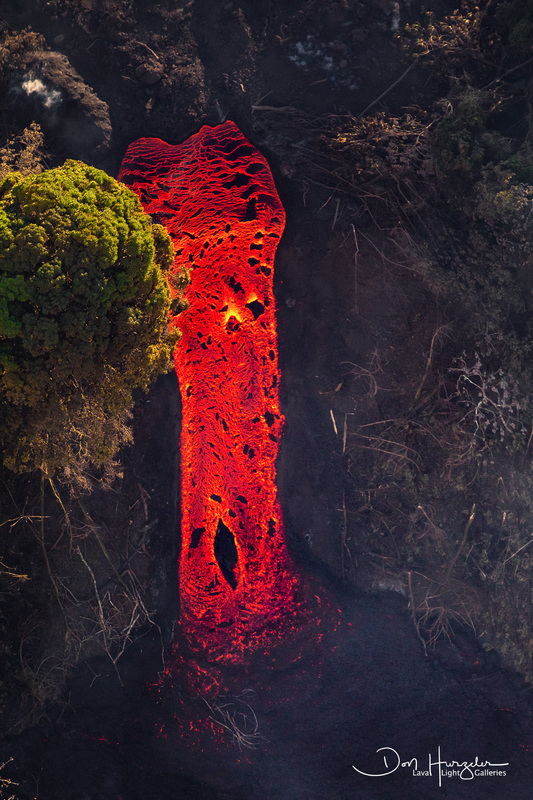 What the pilot spotted was lava that appeared to be forming a lava waterfall at the very end of the lake…it appeared to be flowing from underneath the new lava, over a small cliff and into a further depression of the original lake. It had already evaporated out all the water, but was still flowing to fill up that depression. When I finally spotted it clearly, I was amazed at what I was seeing…a “waterfall” of lava some 40 feet high by maybe ten feet wide…flowing at good speed and quickly filling up the depression. I asked the pilot to bank and see if he could get me a clear shot of the spot. Glad he did, because it not only let me get a clear shot, it let me photograph the entire scene so I could later figure out what I was seeing. When I posted the photo to social media, I got one of the biggest reactions I have ever had to single photo. The photo ran on local television, The Weather Channel and other outlets. A few of the comments claimed it to be a fake…they had never seen anything like it. I then posted all the supporting photos and they all came back to me withdrawing their comments. No hard feelings with those folks…it is a unique photo and quite confusing when it is viewed with no context. This photo has now taken on a life of it’s own being viewed all over the world. If you would like a this image in your home…to remind you of Green Lake or just to see the beauty of this unexpected event…email me at djhzz@aol.com and I will discount the metal image you are interested in by 20% off our gallery prices. Posted in Offers on July 7, 2018 July 9, 2018 by Lava Light. Welcome to the NEW And Nifty Lava Light Galleries Website! Big changes at our place. Nick Selway has headed off to Breckenridge, Colorado to open the Nick Selway Gallery. Don and Linda Hurzeler (if you have been in our galleries over the last five years you have seen their work) have joined C.J. Kale as owners of the Lava Light Galleries. We have replaced about half of the prints in our two Big Island galleries…adding more large metal and acrylic prints. This website has been completely re-done and will become a platform for both our best work and our newest work…which we expect will be pretty exciting given the lava activity on the Big Island as we make this post. Our communications plan is to make it easy to stay in touch with us if you want…and to leave you alone if that is what you desire. More on that in future blogs. Lots more to be added to this site in the months to come. Hope you enjoy it. Come see us on the Big Island…lots to do and plenty to see. Posted in News on July 7, 2018 July 7, 2018 by Lava Light.